The pace of commerce isn't slowing down anytime soon, customer expectations continue to evolve, market trends come and go, and new competitive threats emerge constantly. Let's face it, many retailers struggle to keep up, often hampered by technology that's inflexible, hard to use and not conducive for rapid innovation and building the sort of brand experiences shoppers want. Retailers want a modern commerce architecture that lets them innovate quickly within days not months. They want lower cost of ownership and less overhead. They want upgrades that don't take months to implement and test. They want AI infused so they can do more with less human intervention. They want to be building something new that delights their customers, not spending all their time maintaining what they have today. 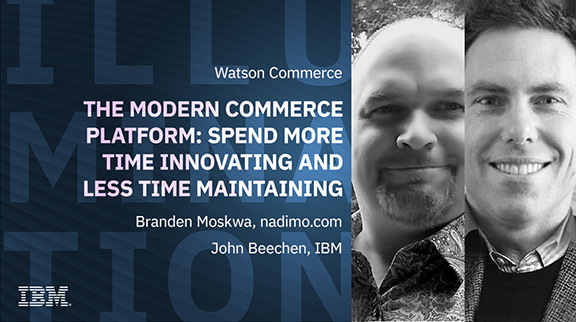 Learn how IBM's cloud-ready, extensible commerce platform can give your organization the flexibility, scale and security to fight back in this age of continuous digital disruption.